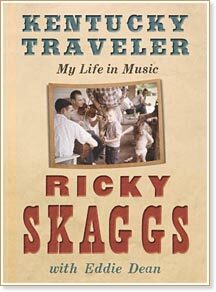 New York, N.Y. — Harper Collins Publishers have announced an August 13 publication of Ricky Skaggs - Kentucky Traveler: My Life in Music, an autobiography. The book tells an honest, deeply American story of the power of faith, family, and music from one of America's most beloved bluegrass and country artists. Unlike other farm boys growing up in the small town of Cordell, Kentucky, Ricky Skaggs learned to play the mandolin at five years old. Sure, plenty of other mountain boys plucked guitars or fiddles, or learned the old songs their grandparents taught them. But few tried and fewer still mastered the mandolin. By the time he was six years old, Ricky Skaggs's talent was clear enough that his daddy knew he had to get that boy onstage. When bluegrass master and mandolin virtuoso Bill Monroe rolled into a nearby small town, Ricky was there. As the crowd cheered, "Let little Ricky sing one!" so began a storied life in music. With Bill Monroe as a mentor and with a family who supported him at every turn, Ricky joined the Clinch Mountain Boys band and became a professional musician at age fifteen. By twenty-one he was already considered a star in the bluegrass world. Yet, following the advice of music industry executives, Skaggs moved away from his roots into the world of mainstream country music—and in doing so, became a country legend and a household name. Despite the hit singles, gold records, and successful tours, Ricky knew there was more to his mission. With a failed marriage and a sometimes strained relationship with his children, Ricky had to make a choice. He would follow God's plan, and rededicate his life to Christ, to his family, and to the music that made him. He would carry the torch lit by his musical heroes Ralph Stanley, Earl Scruggs, and Bill Monroe and, most important, live the life and play the music that would make his mom and dad proud. Telling the intimate stories of a successful career built on passion, drive, and faith, sharing tales of his influences, and fondly recalling the instruments that have shaped his sound over the years and the friendships that have shaped his life, Skaggs paints a unique insider look at the evolution of bluegrass. Kentucky Traveller-Ricky Skaggs. It says Hardcover and Kindle in this advert. Anyone certain if it is available in Kindle as I tried to order from Amazon but couldn't see that option. If so could you please help as to how you get that version.